This course is designed to teach you the knowledge and skills to deal with a sick or injured dog until veterinary care is available. The topics are covered in-depth so that students have a thorough understanding of the principles of canine first aid. Since this is a very comprehensive course, we need your full attention and dogs do not come to class. Cost: Dogsafe Authorized Instructors conduct their own registrations, please contact them directly for their current fees. Dogsafe courses are designed to make complex topics easy and everyone will learn thru seeing, listening, moving and doing which improves knowledge retention. This means that you not only learn topics on course day, but retain the information for the future when you'll need it. Effective, but fun too! even fake guts, eyeballs and more! DOGSAFE: Everything Your Dog Wants You to Know in an Emergency, by Dogsafe creator, Michelle Sevigny is included with Dogsafe Canine First Aid 101 in-person course registration. The 116 page comprehensive manual includes 56 real-life photographs and is reviewed by veterinarians, including Dr. James Lawson, Chief Animal Health Officer of the BC SPCA. even more topics that are not covered in the course -- a priceless manual for future reference. ​Dogsafe Canine First Aid Authorized Instructors have invested in your canine first aid education by providing canine CPR manikin(s). Canine CPR manikins are a vital educational tool that are considerably more life-like than practicing on stuffed toys. Our manikins have working pulse and lungs enabling you to actually perform canine CPR, a technique that is not safe to conduct on live dogs. 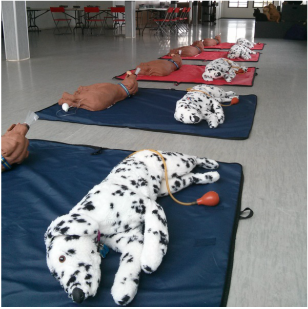 The Dogsafe course goes beyond just watching an instructor demonstrate CPR and provides opportunities for hands-on practice with canine CPR manikin(s). "I learned, and became aware of, so much during my two, very worthwhile, Dogsafe courses. I will speak of them positively to other dog owners. " 8 1/2" x 11" certificate that you can be proud to show your family, clients and, of course, your dog! Our name is recognized and respected as the leader in canine first aid and safety training and you'll be able to proudly display the Dogsafe Certified logo on your company website, brochures and business cards. We will list your dog company on our Find a Certified Dog Professional webpage, a great way to attract new clients. "Thank you for creating the Dogsafe Canine First Aid course, it was the most involving and enjoyable first aid course I have ever taken."